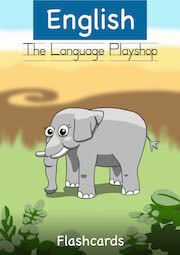 The Language Playshop is a results-oriented course where learning is fun and automatic. The children are given the tools to recall information on cue, and to review the information at home with the help of their picture dictionaries. The words learned in the lesson are actively acquired, while phrases, sentences, and questions are learned through games, songs, and general interaction with the teacher. Because chaos hinders learning, the lessons are fun yet highly structured, so classroom management is of the utmost importance. Fairness and respect are valued, providing a positive learning experience. This leaves the children with a better grasp of the language and a more motivated attitude toward learning English. Empty folders, each with one child’s name on it, to be taken home and brought back to every lesson for the pages of the Picture Dictionary. Extra materials can be useful, and will vary greatly, so I won’t list them here. As you start to familiarize yourself with the games and activities, you’ll be able to see what extra things you’ll need. Materials which are vital for one teacher are completely useless for another. Arrive at the kindergarten 10 minutes early and remind kids to use the toilet and get a drink before English starts. Arrange the room the way you need it, and set up your materials so you can reach everything easily without rummaging around in a desk or in your bag. 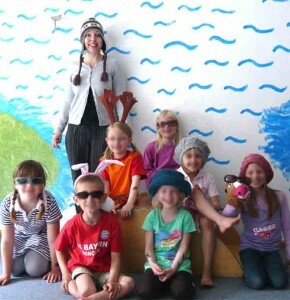 A minute before the lesson, all children should be in the room or on their way. You can sigh and say, “We’re waiting for Victoria, we’re waiting for Marie…” while making exaggerated waiting motions like tapping your watch or resting your chin on your knuckles. Some children will mimic you, and you should use the chance to teach that phrase. When everyone is present, stand on the rug and say, “It’s time for English, make a circle!” It helps if children hold hands; they automatically make a circle instead of just crowding around you or scampering away. Sing or chant whatever short phrase or song you choose. This will be the same starting song you sing each time for the rest of the course. It could be “Hello children, hello teacher, hello English, it’s time to say hello” to the tune of Goodnight Ladies. It could be The Hello Song from the Max and Millie Song Cassette, or an invented song, secret handshake, cheer, etc. “Sit down” pointing at the floor. Hopefully everyone will sit. It helps if you sit down as you say it, and in later lessons you can just say it and they’ll sit. Pass the beanbag and say “My name is (Teacher), what’s your name?” At first the kids just say their names and pass the beanbag. In later lessons, they should work up to the entire sentence. If they are having trouble, use your hand as a puppet and have a fake conversation asking names. Hold up a flashcard and say the word. It might be “Cat”. Put your hand to your ear and say “repeat” or “everybody say ‘cat.’” If the kids don’t repeat, talk to your hand/puppet and say “cat” to it. You can make the puppet really funny or dumb and screw up the word until it finally gets it right. Most kids will repeat you without needing the puppet. If you’re talented enough with the puppet, you can get the children to listen closely and correct any mistakes it makes. Put each flashcard on the floor, stopping after three to review. Don’t teach more than ten new words in any presentation phase. Seven is the best number; eight being the average number on the Picture Dictionary sheets in The Language Playshop materials. When the children have all said each word and repeated the entire pack on the floor, give them a mini test. Tell them to point at the card when you say the word. Encourage pointing, discourage smacking. Call out the words, giving the kids time to decide which one they want to point at. If nobody is pointing at the right card, show them where it is and have them all repeat the word. Call out the words faster and faster, but stop before they start to get bored or riled up. Say, “stand up” and tell the children that it’s time to sing a song or play a game. Choose some songs or games from my list, or from your own collection. Take a moment to explain the game to the kids using pictures of stick men on paper, pantomime, puppets, etc. Don’t take too long explaining because the kids probably don’t understand the verbs and conditionals you’re using. Do a trial run and hope that the kids understand. They generally catch on quite quickly, but if it’s too difficult, play only part of the game and add on after they’ve mastered the basics. If it’s too complicated, scrap it and move on to plan B, or play a modified version of a game they already know. If you’re doing a craft project, show the kids an example of the finished result. Only give them the materials they need for the step they’re doing. If you give them everything all at once, they’ll just start cutting or gluing at random and then they’ll cry when it doesn’t look like yours. Sure, children are creative, but very small kids would much rather mimic adults and “do it right” than branch out and express themselves with something original. Also, it’s much easier to make sure Sebastian isn’t eating the glue if they only have paper and crayons. They should all try to work at the same pace, and the “fast” kid should try to improve the quality of his work instead of just getting up and wandering around impatiently. Set time limits and tell the “slow” kid that there are only two minutes left before all the crayons go back in the box. If you want to use class time to color in The Language Playshop Picture Dictionary worksheet, or if the children ask to color, it can easily flop into a quiet time or a time for the children to chat in their native language. To get the most out of the worksheets in the lesson, teach the children to ask for a worksheet saying, “Can I have the picture?” When everyone has a picture, they need to ask for crayons saying, “Can I have the green?/I need green/I want green” (again, teach only one variation per lesson and mix them only when the children can use them without prompting). Then let them color for a few minutes before going around from child to child, asking them to point at various words saying, “Point at/Where is/Show me the airplane.” If they are old enough to read, and their English is getting quite good, you could give them more complicated clues: “Where is the animal that has black and white stripes? And what is it called?” or “Put your finger on the thing that is found in the kitchen.” The others will start to listen and try to remember as many things as possible so they get a perfect score when you come around to them. Coloring can be a welcome rest for small children who have been expected to focus on learning for an entire hour, or even forty-five minutes. This can be a good activity to get them to calm down if they’re getting too rowdy, but it can also turn into a boring language void if you don’t use it to your advantage. If you find that you’re resorting to coloring for 30 minutes every lesson, plan more games, stories, or songs. Say, “It’s time to read a story.” Depending on the room setup, the kids might have to move some mats around, get some chairs, or go into another area. Your announcement can get more complicated every few lessons and go from “It’s story time” to “It’s story time, get a chair” to “Everyone has to get a chair and bring it here so we can read a story.” Do this gradually and always use the same key words. Only add on when you’re sure the kids have mastered the first version. Mix the new flashcards with one or two packs of previously learned flashcards, and tell the students to stand or sit in a circle. Be sure nobody sees the cards; hold them to your chest or put them face down on the floor. The first kid to your left can start and they all take turns. Hold up five fingers and one card. The child whose turn it is has five seconds (put down one finger per second) to say the word. If they say the right word, they get the card. If the child can’t answer by the time the last finger falls, the other children can call out the word and get the card. If more than one calls out the word, the card goes on the “everybody” pile which is then rationed out at the end of the quiz. The card does NOT go to the loudest child. The child sitting next to the first child has a turn, not the one who got the card; it goes in a circle. Say, “Hold hands and make a circle, it’s time to say goodbye.” Sing or chant whichever goodbye you’ve picked. This lets the children know that the lesson has officially ended. They are not allowed to leave the room until after the end song has been sung. Say, “Bring me your envelopes,” and have the children line up to count their smileys. After the stickers have been awarded, hand out the worksheets (if you didn’t use them already) and let the kids go. They might say, “Can I have a picture?/Thank you! Bye!” and run out.